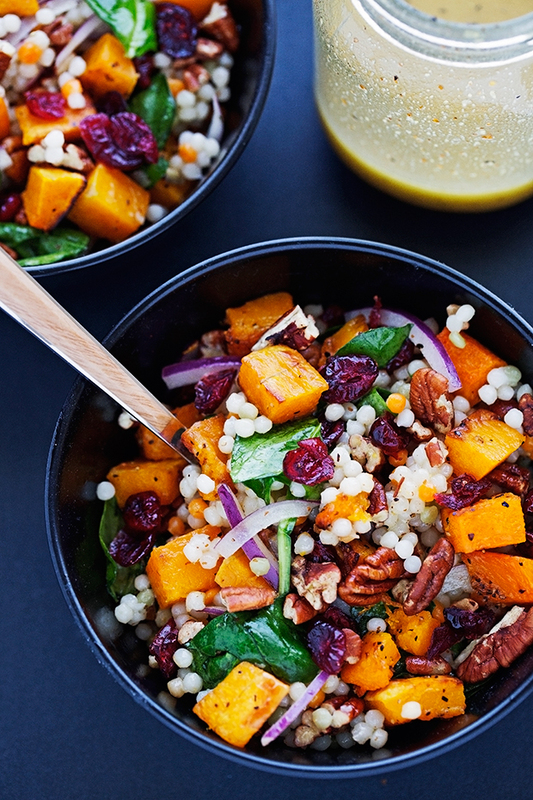 This pearl couscous salad is the epitome of Autumn! 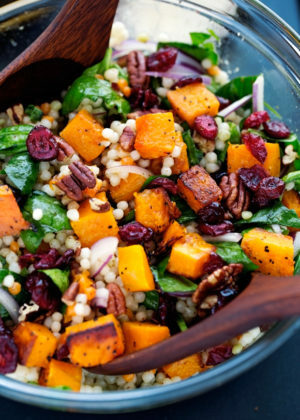 Loaded with roasted butternut squash chunks, tons of sweet cranberries, nutty pecans, all tossed with Israeli couscous, and a dijon vinaigrette. Favorite salad of the season right here. Okay, so I say that about salads all the time but the truth of the matter is, I love discovering new ways of combining ingredients/dressing and pairing them with beautiful colors, textures, flavors, and um.. hello, nutrition? And after having a weekend filled with recipe testing iced pumpkin spiced old fashioned doughnuts, (they’re comin’, they’re comin’) I need a lot of this salad to reel me back into the world of normal, healthy food. 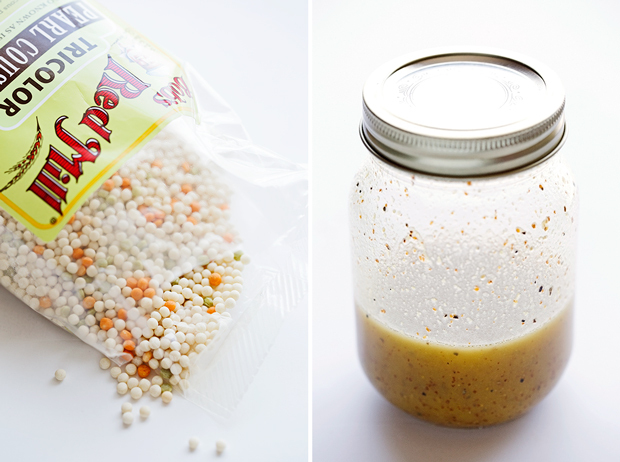 What gets me the most about this pearl couscous salad is the simple dijon vinaigrette dressing. It’s easy, it’s homemade with ingredients you keep in the pantry, and it’s way better than the store-bought stuff. Did I mention that it’s just tossing ingredients into a mason jar and giving it a couple of good shakes? Sometimes I catch myself singing “Shake It Off” while shaking the dressing. And it totally makes making dressing just a little more fun. Let’s reflect on the Israeli couscous (or pearl couscous) in this salad for a second. They are small, teeny, tiny little nuggets of toasted semolina flour or wheat flour that closely resembles pasta. I love the chewy, slight nuttiness of it in the salad as it pairs beautifully with the roasted butternut squash and the dried cranberries. Pearl couscous can be difficult to find sometimes, so you could simply replace it with orzo pasta, cooked wild rice, or a wild rice blend. 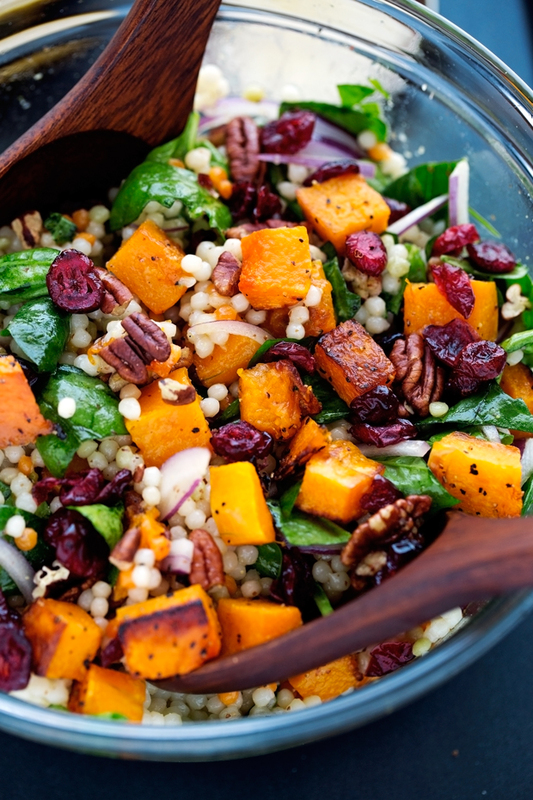 Either way, with or without the pearl couscous, this autumn harvest salad is perfect for this time of year. Because, I’m on a mission to fit in as much squash into my diet as humanly possible in these next couple of months. I’m like a squirrel hogging it all to myself. It’s the perfect ‘meaty’ vegetable that this pearl couscous salad needs. It’s earthy, hearty, and filling. Just a simple toss in olive oil with a pinch of salt and pepper and I let it all roasted up in the oven for 25 minutes giving it a toss every 10 minutes or so. Easy babysitting but totally worth it because it takes a regular old salad to the next level. And we like next level salads, don’t we? The last step before eating, give it all a good toss in the dressing! Keep in mind the dressing will cause the spinach to wilt so if you don’t think you’ll be able to finish it all in one go, dress half the salad and leave the other half for later. this makes 4 decent sized servings of the pearl couscous salad. We almost always have leftovers so I only dress half and keep the rest separate so lunch is just as fresh as dinner. Position a rack in the center of the oven and preheat the oven to 425ºF. 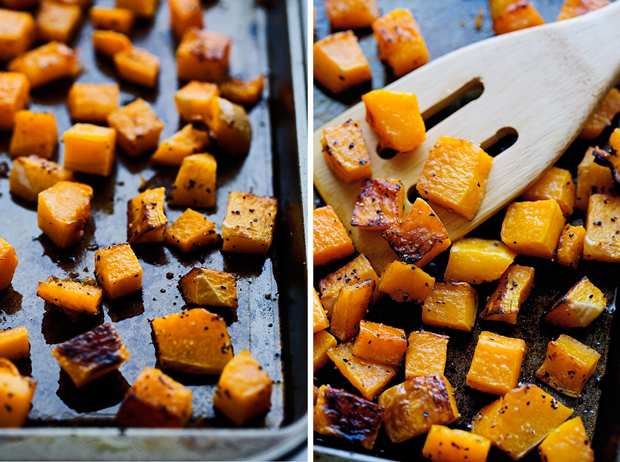 Place the diced butternut squash on a baking sheet, toss in olive oil, and sprinkle with salt and pepper. Spread squash out in an even layer. Roasted squash for 20-25 minutes total, tossing halfway through or as needed. While the squash is roasting, prepare the couscous according to package directions. DRESSING: Add the orange juice, mustard, garlic powder, honey, apple cider vinegar, olive oil, and a pinch of salt and pepper to a mason jar. Screw on the lid and shake until combined. Taste and adjust seasonings as desired. ASSEMBLE: In a large bowl, toss together all the ingredients of the salad with the dressing and serve. Alternately, you can dress only portions of the salad and refrigerate the rest in an airtight container.